companies and hotels throughout Minneapolis and metro area. how we can benefit you and your customers. uniforms, Banquet linens, drapery and bedspread /comforter cleaning. 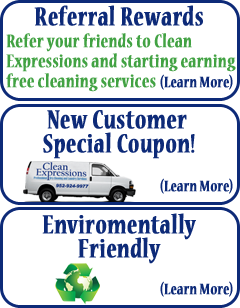 Clean Expressions provides pickup and delivery dry cleaning & laundry service to businesses and hospitality industry in Minneapolis metro and surrounding. We service customers that range from individuals to large wholesale clients including hotels, restaurants, and corporate offices.